I am so excited to partner with BJ’s Wholesale Club to bring you this great recipe. While this post is sponsored, all thoughts and opinions are my own. The new year is always a great time to try new foods and add in some healthier options. Start with these amazing chicken stuffed bell peppers and your tastebuds will thank you! January is always a great time to try to bring in healthier food options. Since October, I’ve been working on introducing new foods to my family and finding easy ways to make recipes healthier without sacrificing taste. 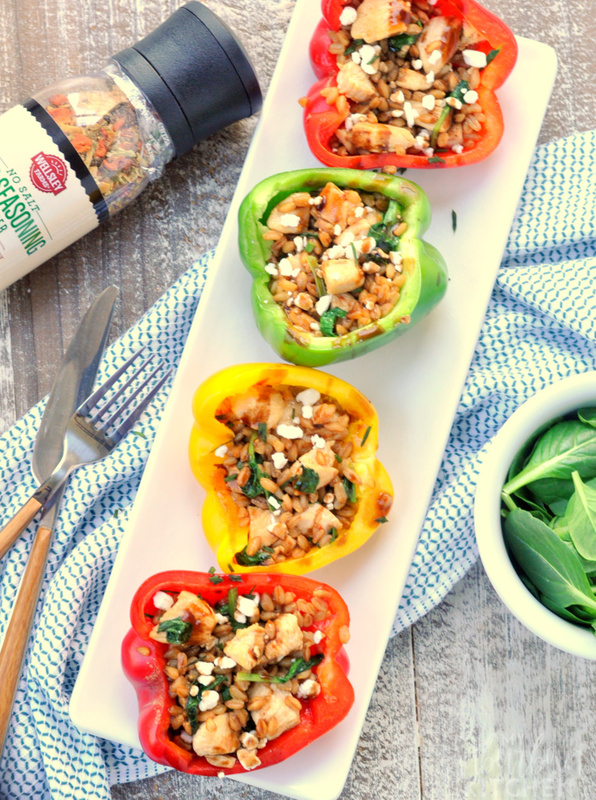 This chicken stuffed peppers recipe is high on flavor and healthy ingredients and low on the time it takes to get it on the table. One of the biggest reasons people avoid healthier recipes is because they think they will taste bad or require a lot of work to make. You can still add in tons of flavor without increasing fat and calories. 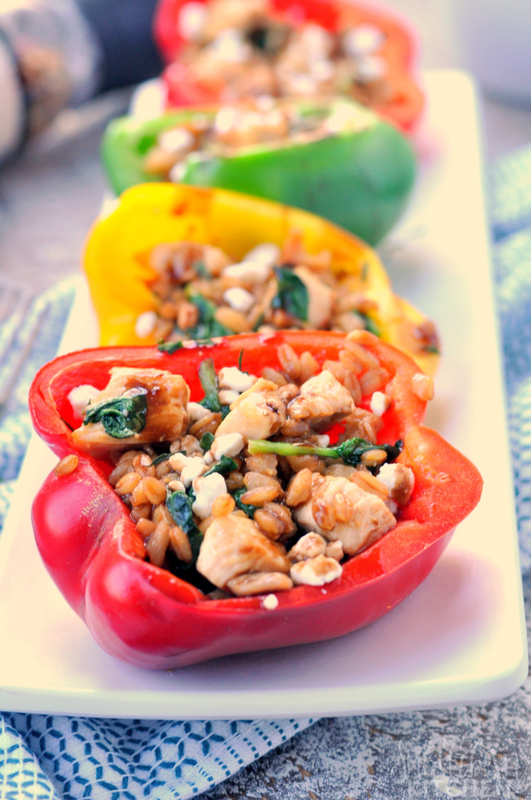 This balsamic chicken stuffed peppers recipe is a great example of this! What are some ways to make a recipe healthier? One major way to make a recipe healthier without sacrificing taste is to use lots of herbs and spices. BJ’s Wholesale Club is an amazing place to stock up on great spices. 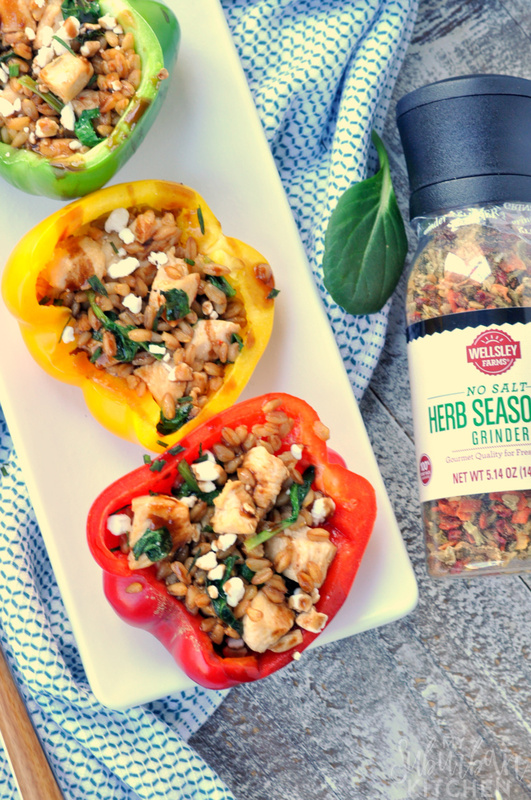 One of my favorites is their Wellsley Farms No Salt Herb Seasoning. I use it in TONS of recipes and it adds so much flavor. Another great way to make a recipe healthier is to add in vegetables or replace some ingredients with vegetables. 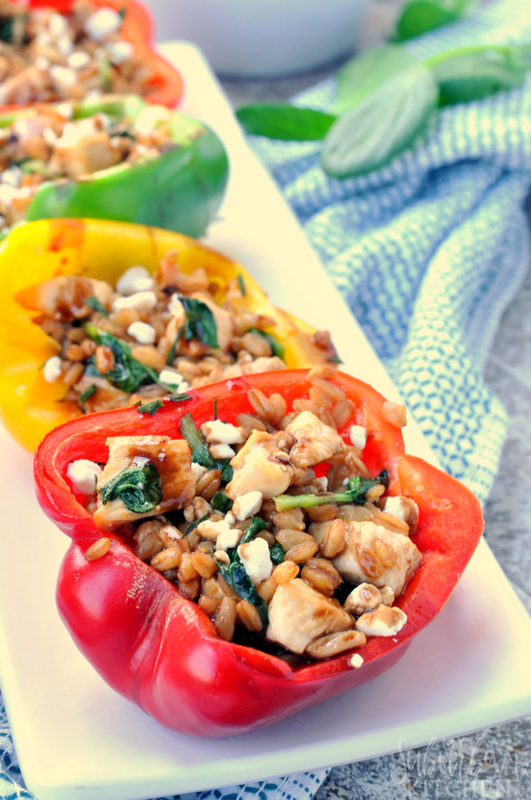 These chicken stuffed bell peppers have baby spinach in them in addition to using the pepper as the “holder” for all the filling. Lastly, consider leaving out, reducing or swapping out grains in a recipe. 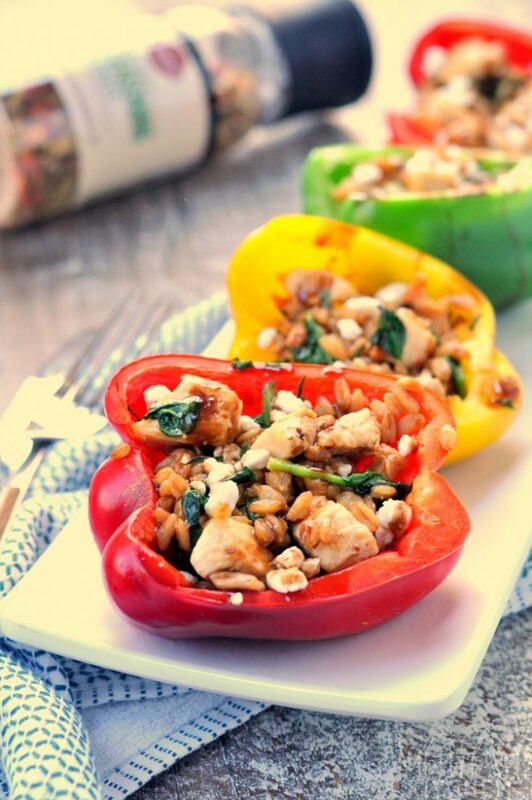 Typically, you will find chicken and rice stuffed peppers. For this recipe, I swapped out rice with farro and then reduced the amount that would typically be used. In its place, I increased the chicken (lean protein) and added in vegetables. Shopping at BJ’s Wholesale Club for ingredients is perfect whether you are making this recipe for dinner or intending to use it for meal prep. They offer a great value on fresh produce, meats, and have loads of spices to choose from to customize this recipe to your tastebuds. Plus, they are the only warehouse club that also allows the use of manufacturer’s coupons making it the best value around! 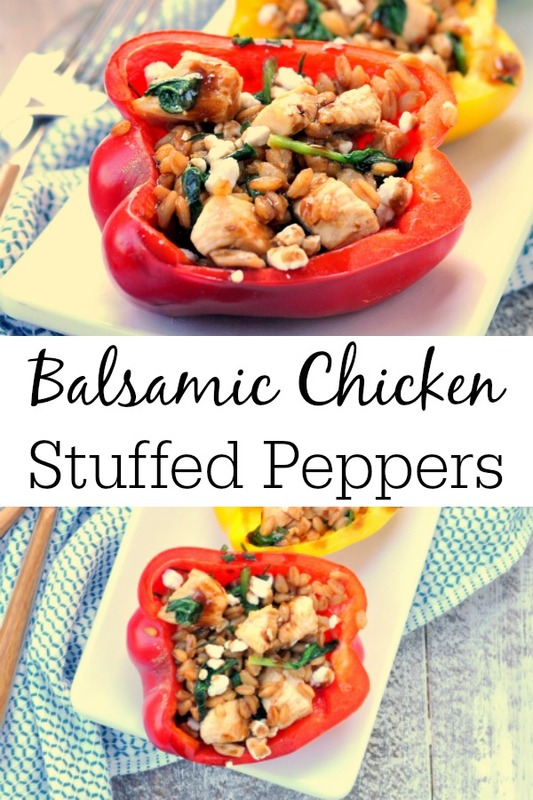 If you try this recipe for balsamic chicken stuffed peppers or any other recipe from the blog, I’d love to hear about your experience. Let me know in the comments or snap a photo and tag it #MySuburbanKitchen on Instagram and Twitter. These balsamic chicken stuffd peppers are a super easy healthy recipe that the entire family will fall in love! Big on flavor but small on prep time makes this a winner. Season chicken pieces with salt, pepper, and Wellsley Farms No Salt Herb Seasoning. Heat avocado oil in large skillet over medium-high heat. Cook chicken, stirring occasionally, for 4-5 minutes or until no longer pink. Stir in 1 Tbsp balsamic vinegar, cooked farro, and baby spinach. Stir well and cook for 2-3 minutes or until spinach begins to wilt. Place bell pepper halves in baking dish. Divide chicken mixture between bell peppers halves. Sprinkle goat cheese on top. Cover with foil and bake in preheated oven for 10 minutes. Remove peppers from oven and drizzle with remaining 1 Tbsp balsamic vinegar. You can use ground chicken in place of chicken pieces. Just add seasonings after chicken is cooked and crumbled in the pan. If using this recipe for meal prep, I recommend shortening the baking time to 5 minutes or skipping it all together if you prefer a crisper pepper. Feta works in place of crumbled goat cheese as well. I will never make stuffed pepper any other way after trying this recipe! It was amazing! Wow – I love how simple this recipe is but so full of flavor. And I love love love farro! one of my favorite grains.